Lawnmageddon! comic from Plant vs Zombies now available on iOS devices for free as a promo, download now! The popular tower defence game, Plants vs Zombies has gone comic. 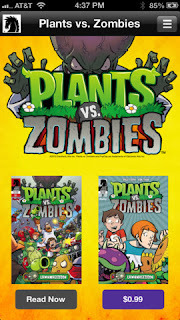 The publishers Dark Horse Comics have released a comic called Plants vs Zombies: Lawnmageddon. The comic has been made free as a promo after which it will cost $0.99 (Rs.55.00). "We're excited to see Plants vs. Zombies come to life as a comic book miniseries from one of the industry's coolest and most innovative publishers, with Plants vs. Zombies Adventures recently launched on Facebook, Plants vs. Zombies 2 becoming available for iPads, iPhones, and iPod Touch devices later this summer, and Plants vs. Zombies Garden Warfare shambling to market in spring 2014, it's a great time to give the millions of Plants vs. Zombies fans around the world a new way to enjoy this beloved franchise." In the meantime the publishers are getting ready to launch a sequel for the Plant vs Zombies. If you have played the game, you might enjoy the comic. If not then reading the comic may get you itching to play the game. You can download the current issue of the comic from Apple Store here. The next issues will be released on July 24 and 31, and August 7 and 14. The company will also launch a hardcover version of the comic, which will hit comic store shelves in the month of November.